The documentary takes you into the magical world of filmmaking and lets viewers participate in the creation of "Babylon Berlin": how did the idea arise, what difficulties had to be removed? 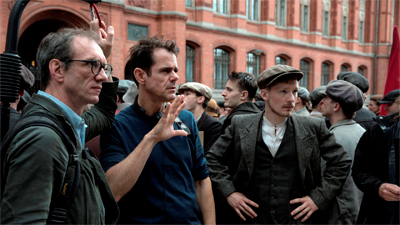 Tom Tykwer, Henk Handloegten and Achim von Borries report on the collaboration as directors and authors of "Babylon Berlin". The main actors Liv Lisa Fries and Volker Bruch give an insight into their shooting experiences. Other speakers include actor Lars Eidinger, production designer Uli Hanisch, novelist Volker Kutscher and many others. A fascinating look behind the scenes of the series event.